Lights and bikes are aren't an unfamiliar pair. But only Cyglo Tyres, a recently-patented design that embeds LEDs into the tire treads themselves, will turn your wheels into two perfect circles of light. 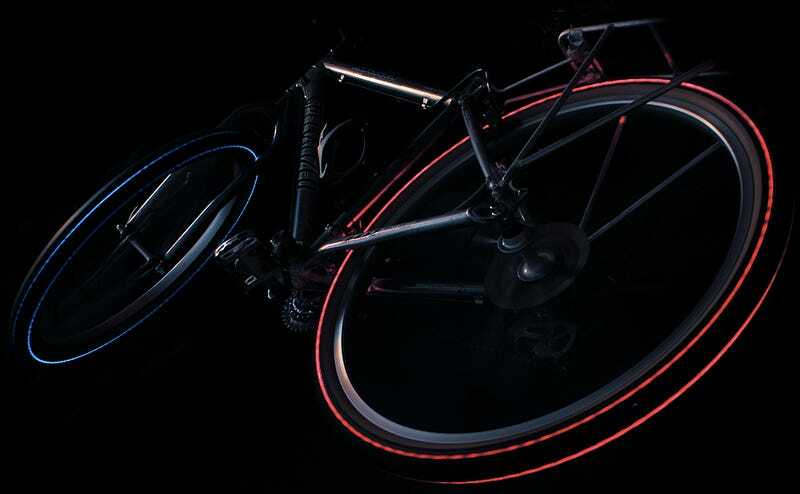 Cyglo Tyre, a UK company founded by James Tristram, embeds LEDs directly into the tire tread (as opposed to, say, the spokes) where the lights are powered by the circular motion of the tire itself. Tristam sees his light-up wheels as an "unprecedented safety measure." I see them as the most viable light bike accessory for my after-hours TRON cosplay.